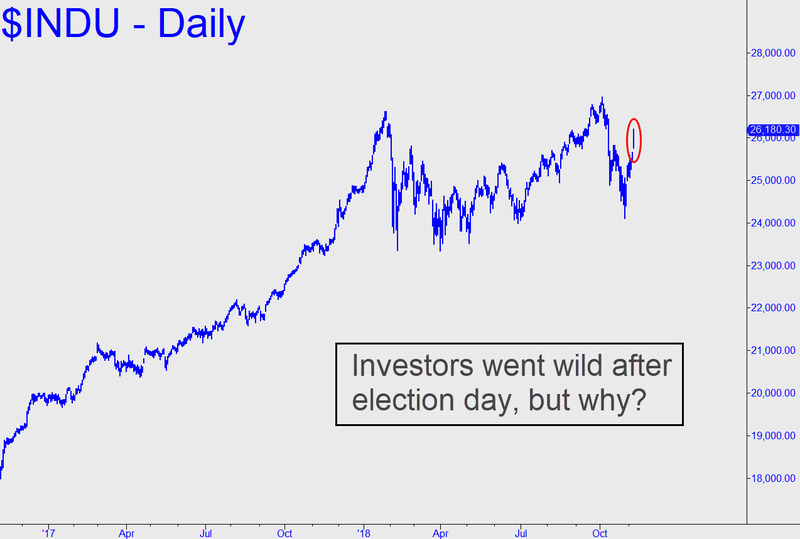 Midterm Results Trigger a Bullish Frenzy, but Why? When I projected a 549-point Dow rally here Tuesday night, I wasn’t expecting it to unfold in a single day. The actual gain was 545 points, an exuberant reaction to a midterm election that will split power on Capitol hill between the two parties. The rally left the Industrial Average exactly 771 points shy of the record-high 26961 achieved on October 3, but I’d need odds to bet that it won’t be reached. If so, and the blue chip average makes a presumably marginal new high, we should look for ways to get short, since many factors weighing on the stock market before the election will still be present. They include a strong dollar that will hurt the earnings of multinationals, an incipient collapse in residential real estate, rising interest rates and corporate earnings that may have peaked. In addition, any further gains from pro-business legislation on Capitol Hill are unlikely, since Trump’s legislative agenda will be stymied by a House now ruled by anti-business Democrats. Under the circumstances, Wall Street’s celebration could prove to be short-lived. is a 22 Universal Month. his 22 Personal Year Cycle. is in a 22 Personal Year Cycle. Great call Rick and have a great day. Maybe because of the upcoming gridlock between the Democrat House vs Republican Senate. While the former won’t ever pass any MAGA legislation, the Senate won’t be approving any of their super-mega-socialist BS, either.